Welcome to M.N. College Visnagar. 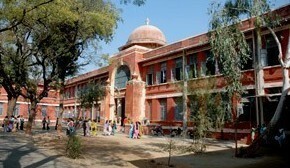 It was the only government college of its kind in the whole region between Ahmedabad and Ajmer. It is still a matter of great pride that the college has as its first Principal Shree V.K.Gokak, a ‘Gyanpith’ Award winner, a well-known Poet and Professor of English, who nurtured and nourished the college in its childhood.